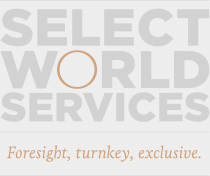 Select World Services (SWS) is a global, full-service event company offering complete, 100% turnkey event planning & management services, programming & production, entertainment & special event coordination, and event promotion. Our services are available throughout the globe to assist companies in delivering highly-effective, result driven events, proven to deliver ROI. SWS works with global companies to achieve strategic objectives and deliver events which will save organizations time, money and resources. We pride ourselves on a high-quality executive approach to deliveries. Our experience and reputation for excellent customer service and return on investment make us stand out from the competition. SWS values our customers. to over exceed any and all of your event requirements in any city around the globe.